Hearty and delicious quick cooking jumbo oats with sunflower seeds, pumpkin seeds and linseeds, gently steamed and rolled for a proper porridge full of flavour and texture. 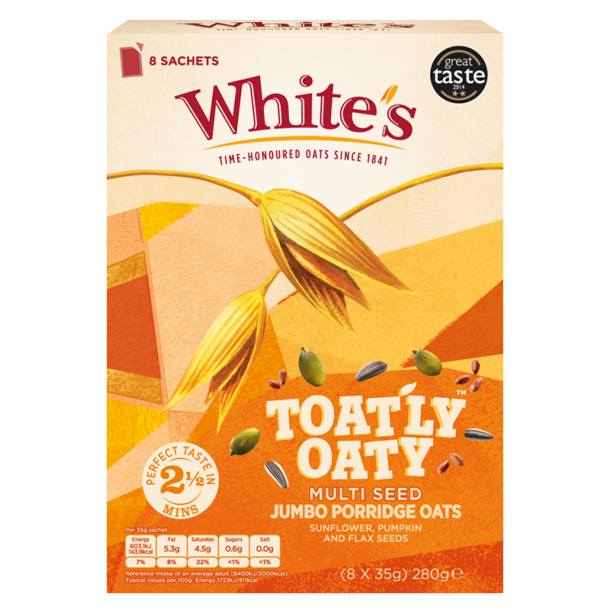 Toatly Oaty multiseed helps release energy slowly throughout the morning with its energy boosting nutrients. Packed in individual microwaveable sachets which can be easily prepared in just 2 minutes for a convenient start, so even if you’re short on time, take a moment to enjoy our deliciously creamy porridge.